So I'm a sucker for a dramatic sky, and was this one! 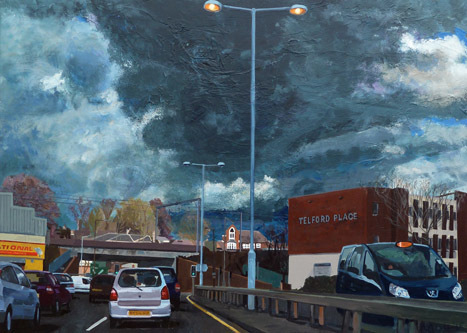 Based on a photo taken in the Urban sprawl of Luton, this threatening sky manages to dwarf the man made landscape. I'm very pleased with the result as the colours appeal. In fact a lot of the colours were made up as the iPhone photo this piece was based on was rather murky in the gloom. To convert from the digital to the analogue medium of paint is rewarding and essential. Indeed it validates the process as I could just print out the photograph otherwise and save myself a lot of time. Having a strong vertical in the middle of the piece has might cut the picture in two – but with it being tonally similar to the background I feel only interest is generated. I did get confused with the structure of "Telford place" so I googled some images of this for better reference. So sometimes the vagueness of the source material can be and advantage stimulating creativity, and on other occasions it just means you do it wrong!